Qatar Youth Hostels i Doha, Qatar: Reservér nu! 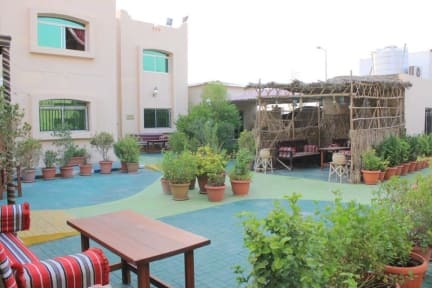 Our hostel Qatar Youth Hostels is very luxurious one. It is also quality certified from HI. You can logon the internet using your laptop any time any anywhere inside the hostel as there are 9 wireless routers covering the whole hostel. We offer the following facilities and services: Games room - Table tennis / ping pong- TV room - Suitable for wheelchair users - Restaurant onsite- Computers- Wifi- Air Conditioning- Laundry Facilities- Library / Book Swap- Car Parking at Hostel- Smoking Area. Different kinds of restaurants are available near the hostel. You can take bus no. 45 from in front of the hostel till the city center. Each room at Qatar Youth Hostels contains a LCD TV with Satellite receiver, mini bar. Some rooms have bathrooms with showers and other don't have; but even the shared bathrooms and showers are luxurious. Payment upon arrival by cash (QAR), credit cards. Please remain calm as much as possible. Please maintain the cleanliness of your room and other facilities. Smoking harms your health and the health of our guests. Smoking is not allowed on QYHA premises. There is a place dedicated to the food and please do not eat meals outside the designated area. Please note that the times of meals as follows: - Breakfast from 7-9 am - Lunch from 12-2 pm - Dinner from 9-7 pm. Your guests are welcome on our premises but please do not take them inside your room. Internet is available for free in the tent; please ask the administration for the access code. Qatar is an Arab and Muslim country, so please respect the national customs and traditions.